Corex Plastics CEO Simon Whiteley has offered to walk a small and select group through his facility to demonstrate how he continues to reduce energy costs within his business. 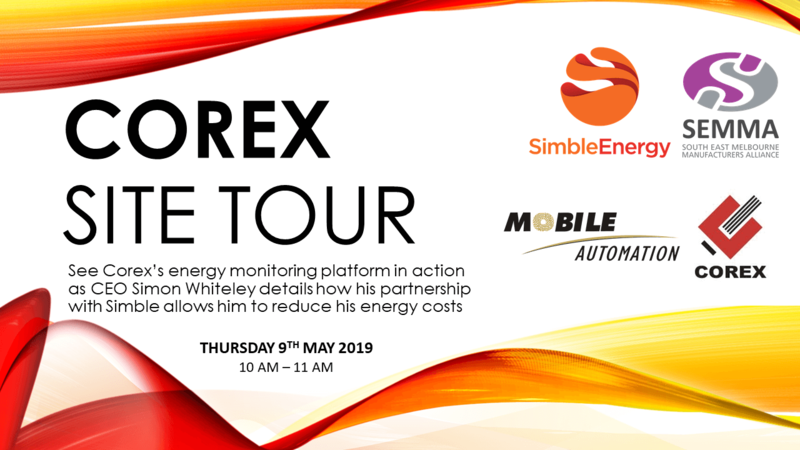 SEMMA in collaboration with Corex invite you to see the Simble Energy monitoring platform in action. Learn how Corex achieved savings of 15% to their bottom line, and how SEMMA fostered a working relationship between Corex, Simble Energy and Mobile Automation. RSVP to this exclusive tour is essential!